Ah, the blessings and the bane of learning a new craft technique! I’m talking about making iron-on appliqué embellishments with a cutting machine, and attaching them to fabric. These projects are to celebrate the upcoming St. Patrick’s Day festivities. This is the bag pattern from a previous post, when I made a Valentine’s Day [sort of] tote bag, using the pattern from Sew News. The main difference, besides the theme of the holiday embellishments, is the fabric of the bag. For the previous project, I used a cotton canvas remnant. But when I went to Joann Fabric to buy some more of it, I couldn’t find it in the store. I could have substituted duck cloth or twill or denim, for a similar, but not the same weight and feel. This fabric looked and felt very similar to cotton canvas, while it was on the shelf in the Utility Fabrics section of Joann’s. But it was cheaper and was 100% polyester. And once made into a bag, the fabric had a few noticeable differences. Difference #1: it seems to be more wrinkle-prone than cotton canvas. Difference #2: you have to use a different method to adhere iron-on appliqués to it, than you would with cotton. Cricut Easy-Press 2 Interactive Reference Guide recommends that you use their brand Iron-on Protective Sheet when applying the iron-on embellishment. I had never seen or heard of it, so I didn’t have one of those, but I did have a Teflon sheet that I sometimes use for applying Wonder Under. So I used that. Also, the temperature needs to be a little lower than cotton. Yup, I can vaguely recall using an iron on certain man-made fabrics and literally melting the fabric into a sticky goo. Here are some finished, decorated, shirts for celebrating St Patrick’s Day. Put them in the bag and go! I looked in the fabric stash, and of course I had a suitable remnant just the ideal size to make two of these for our recliners in the TV room. Bright red, already quilted cotton and a green plaid little piece of cotton with a coordinating red stripe. Instead of trying to machine embroider the quilted fabric, I decided to stitch the Santa motif onto a thin piece of red fabric I found, that had slits all over it from something. Maybe it was involved in a knife fight? Or someone at the fabric store opened a box of bolts with a razor blade and slashed it? Or the fabric has been in the stash so long it just shredded from age? It is a pretty close color match to the quilted cotton, so I just appliquéd it on with a satin stitch. And, I was able to use the mirroring function on the Viking to make two opposite-facing images of the Santa motif, which I bought from Embroidery Library. I cut the plaid fabric into 5-inch-wide strips, sewed all the pieces into one long strip, then folded the strip in half and pressed it. The idea was to make it like bias binding, except I didn’t cut it on the bias, but rather, the straight grain. I knew better: bias would have been ideal, but I’m too lazy to want to try to cut fabric at the perfect 45 degree angle. Too many opportunities for it to get screwed up, and I’m done when it comes to dealing with more holiday stress! Then I folded each loooooong end of the binding strip under about 1/2″ and pressed them under. Next step, after binding, was sewing on some Velcro strips to attach the headrests to the backs of the chairs. The sticky-back strip will go on the chairs. Meanwhile, although it’s chilly outside, gorgeous flowers are blooming in the yard. Feeling very thankful for this time, this season, this holiday! What is it like in your winter wonderland? What is making you happy? So far, almost every day since the beginning of October, the temperature has gone up to at least 80° F. But the nights are cooler. Which means I want to have enough blankets on hand. Blankets are passive accessories until late at night when one is freezing in bed–then they turn into proactive warriors, intent on guarding and protecting you from the enemy. 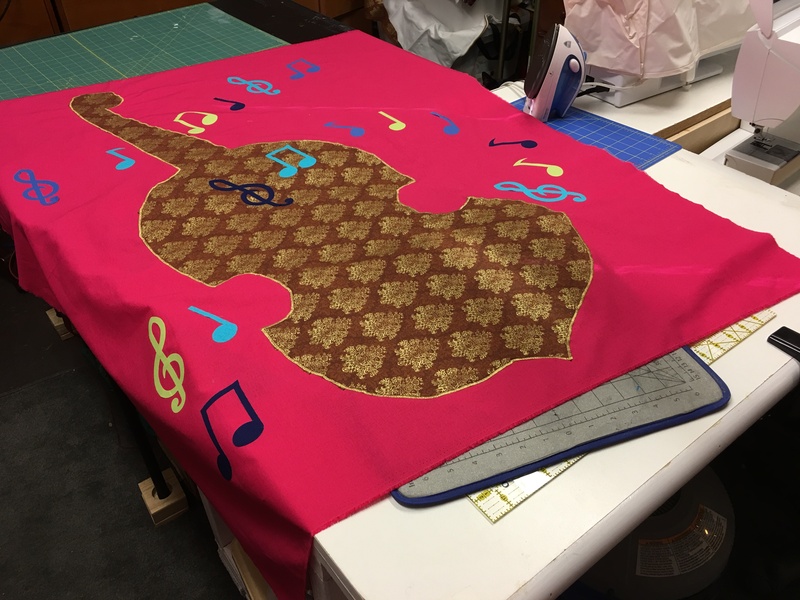 The center panel features a big appliqué of a cello (eyeballed and cut) and some musical note appliqués cut using Accuquilt templates, ironed on to the fabric using Pellon Wonder-Under, then machine-sewn around the edges with a satin stitch. 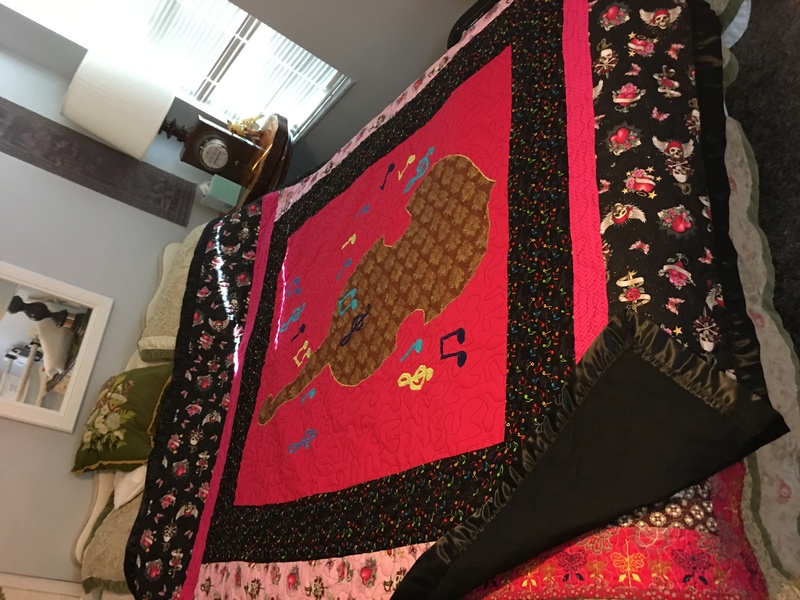 I chose colors for the note appliqués, from some American Made brand cotton fat quarters, that matched up with the colorful musical notes on a black background in the fabric I planned to use as the nearest border. Buffalo-check plaid is very popular this year. I made one of these in blue also, both with matching satiny-fabric backings because–they love it, it is ideal woobie-fabric. 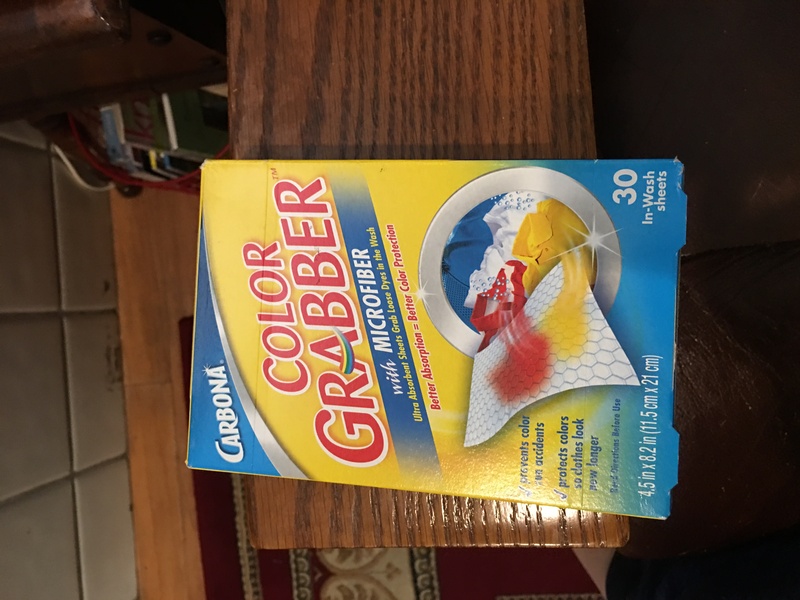 Best as a precaution to keep those fabric dyes from bleeding onto each other. I’m not worried about the American Made Cotton bleeding, but some other fabrics–you don’t know. We’ve been taking a break from blogging and vlogging, and it sure gives me a different perspective on life! Changes in lifestyle–such as living through the aftermath of a hurricane, losing your vision, retiring from a high-paced career, or getting sick–can take a toll on the ol’ creative process. Documenting our every creation adds a level of stress to each project. I like blogging; it’s Show and Tell for the Digital Age. But not having to immortalize an item via posting it, can sure be freeing. If the project does not live on in my [limiting] descriptive words, it still lives on as what it is: a creative accomplishment, a spark of ideas, a sense of wonderment, a nod for practical uses, shared audacity that might elicit a smile. 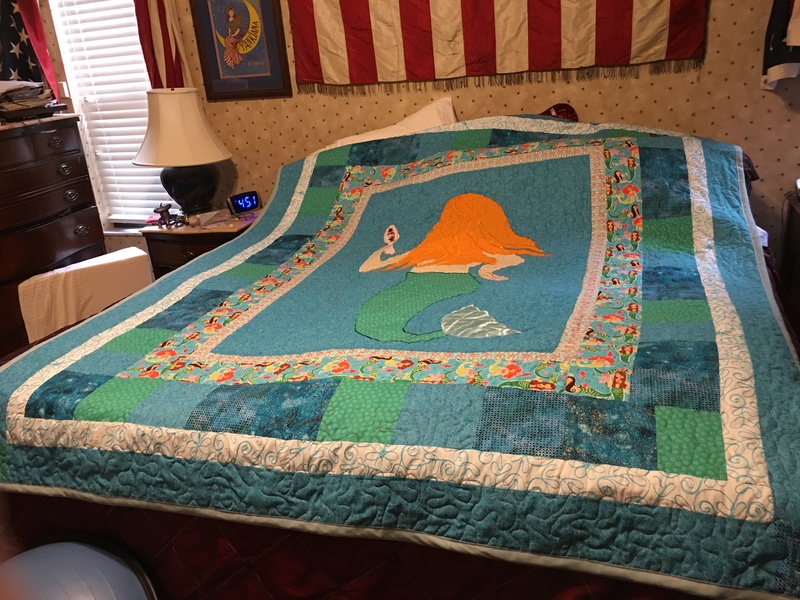 It is lying on top of a king-size bed, so it is pretty massive, the biggest quilt I’ve made from scratch, so far. The backing is 108″ wide cotton fabric from JoAnn’s, one large sheet of fabric with no seams down the center. The binding is a discontinued color of Wright’s Quilt Binding: I bought three 3-yard packages of it on clearance and I used all of it but maybe 6 inches. Whew! It looks gray in the picture but it’s actually a grayish light blue-green color. Which is better, cotton or polyester? It used to be cotton all the way, however, there are so many cool polyester fabrics, it would be a shame to miss out on them. Am I right? 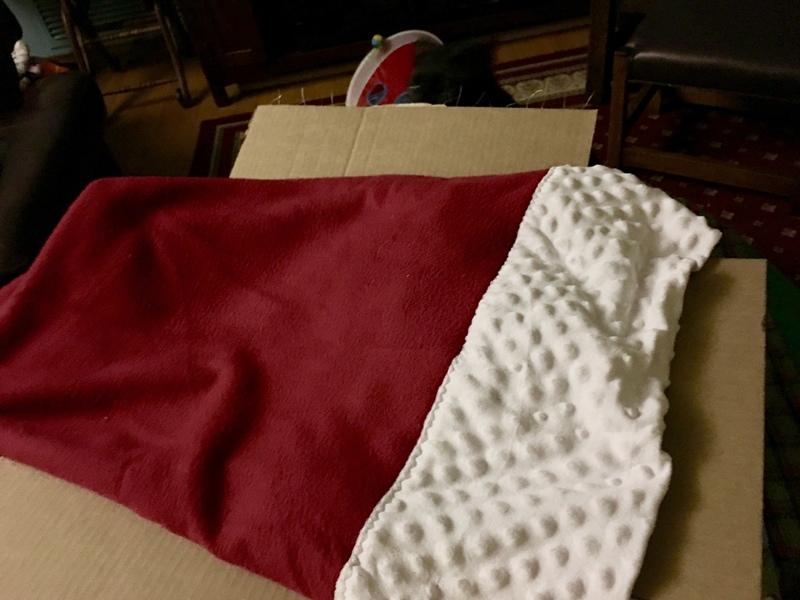 The idea for this Santa blanket came from looking through my fabric stash. The stash includes a big box of polar fleece, minky, minky dot and velour-type fabric remnants, mostly polyester or cotton-poly blends. Our local JoAnn store will roll up some fabric remnants for sale at 50% (sometimes 75%) off. Most apparel remnants are less than a yard, but most Home-Dec items, including blanket-type material, can be a yard or more. I figure that one yard of fabric 50 to 60 inches wide is a good size for a lap quilt or a baby blanket. If less than .8 of a yard, it would look better pieced with some other fabric. The main part of this Santa blanket is a high-pile red minky that’s velvety soft on both sides. I think it’s the ideal fabric for a soft blanket. 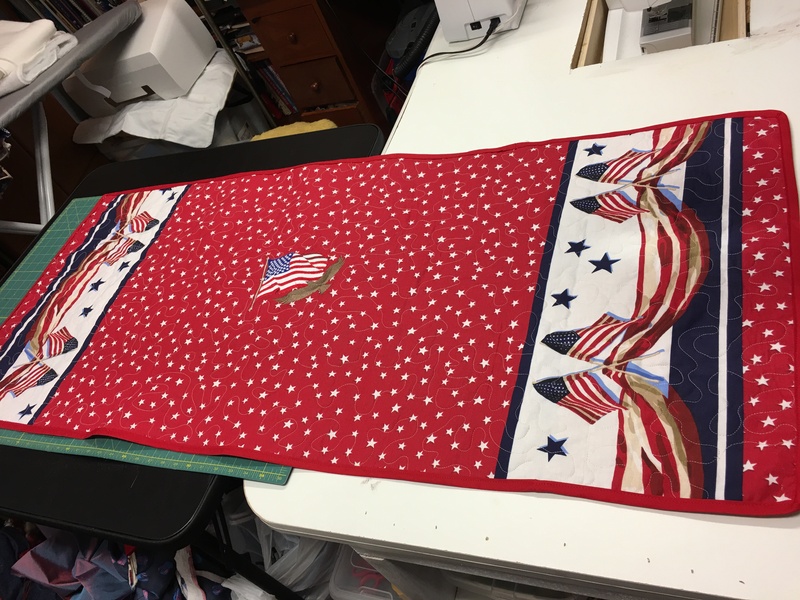 The edges are trimmed with thick bands of white minky dot fabric sewn on right-side edge to back edge of blanket, folded over and sewn down, which are supposed to be reminiscent of the trim on Santa’s hat and suit. 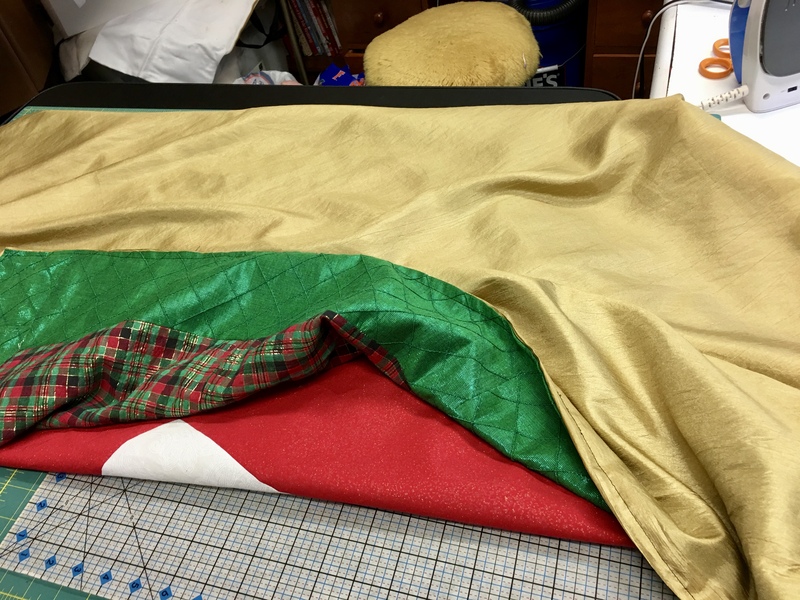 The next is a takeoff on the Santa blanket, except the center part is pieced and backed. The top is made of 3 pieces of flannel (flannel is a cotton fabric) in red, black and white. 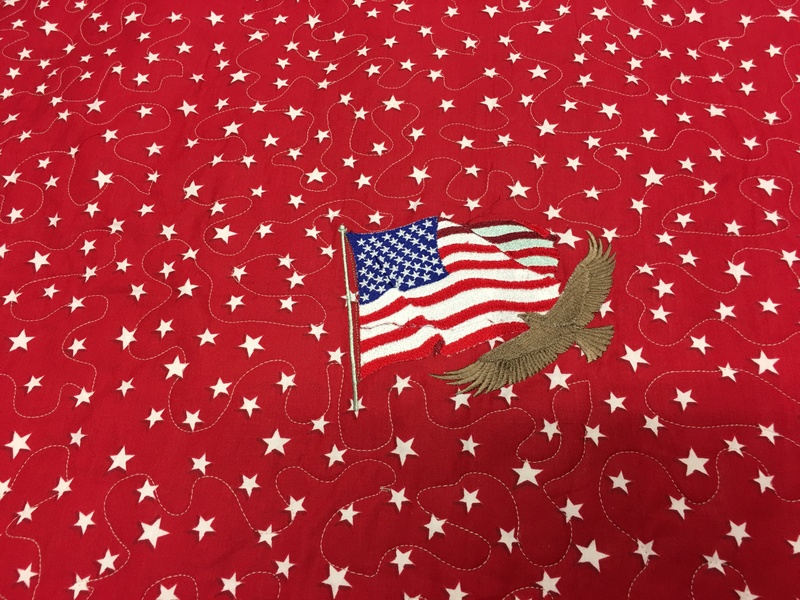 The top was sewn, right sides together at two edges, to a piece of red minky dot fabric (polyester). Actually, the back is two pieces; I had to add a strip because the back wasn’t quite big enough. The big fabric cylinder was then turned inside-out. 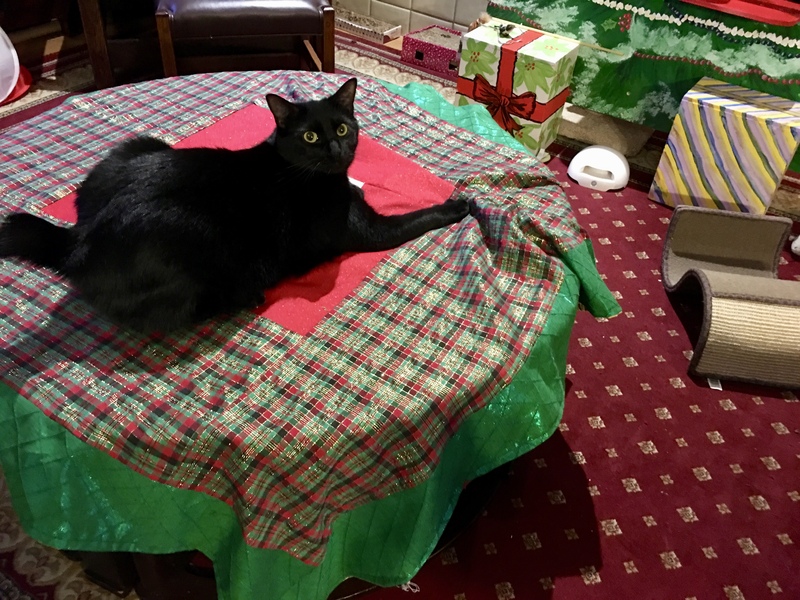 Then two wide strips of black minky dot fabric were sewn on the two ends with still-raw edges, folded over and sewn down, à la Santa blanket above. I wasn’t very happy with the way it looked constuction-wise, so I decided this one is going to be kept on our couch, ain’t nobady’s business if I do. 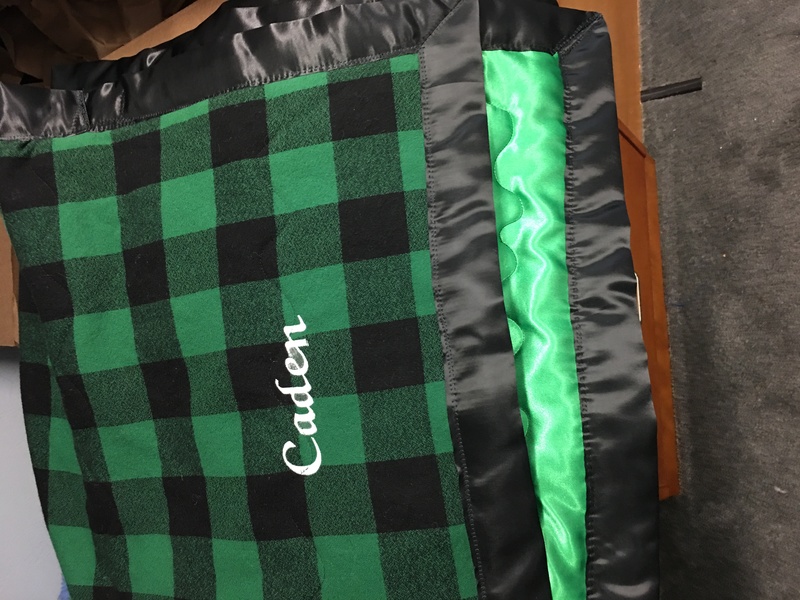 If I decided to give this as a gift, I probably would have put a layer of polyester batting in the center and quilted it together. If not tacked together in the center (which this one isn’t), these layers of fabric will probably crackle with electricity when you shake out the blanket. I always worry about stuff like that. For instance, you see along the selvage, on really cute children’s pattern flannel and other fabrics, the buzz-kill warning: Not to be used for children’s sleepwear. You can google this and find that there are several points of view: that some of these fabrics could catch fire easily. But then, commercial pajamas for kids have chemicals in them to serve as flame-retardants to the fabric in case it does catch on fire. I can remember my kids wearing sleepers that, when they’d been washed about a zillion times, really did crackle and spark with static electricity when they were romping around in them. Wonder if the flame-retardant chemicals washed out after a while? Wonder if the chemicals contributed to eczema? Wonder if shaking out these blankets full of static electricity could cause a fire? And while we’re on the subject of polyester fabrics, there’s a new contraindication going around: shellfish are eating little pieces of plastic that they find in their natural habitats, which are in turn passed on to us at the dining table. Researchers have found that one source of the tiny plastic particles in seafood is run-off water in which polyester clothes are washed. Here’s one article. We could wall ourselves off from all polyester and acrylic contamination: wear only organic fibers, eat only organic foods, wash with soap that doesn’t contain exfoliating pellets of man-made whatever. Or maybe it’s too late for that? Maybe it’s a step in the ultimate direction of The Singularity, where mankind becomes one with machine…it starts with our food sources ingesting plastic, and then little by little, those plastic components creep into our metabolisms, our anatomies, our selves? I think I like cotton better. Decorating for the holidays: I’m all for simplifying! 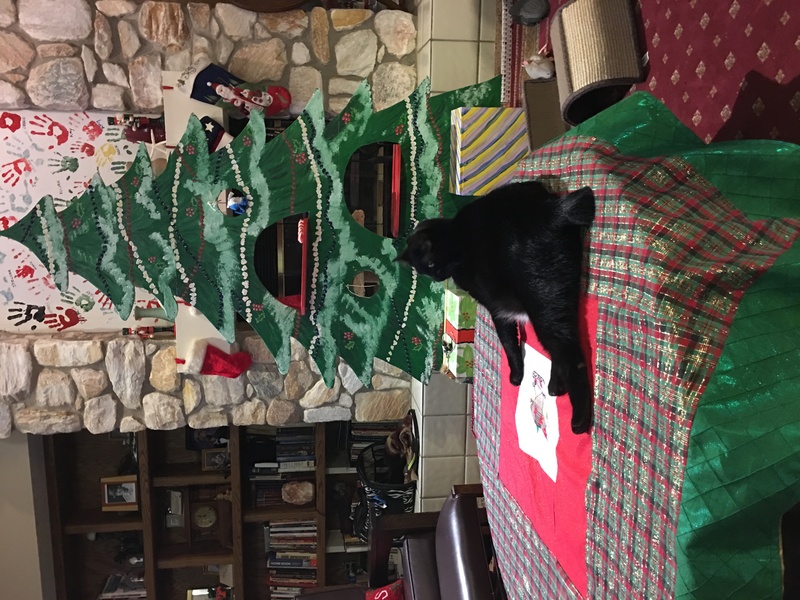 Last year, the kittens were less than a year old at Christmas, and we knew that if we brought an 8- or 10-foot tree into the house, it would get crazy in here. 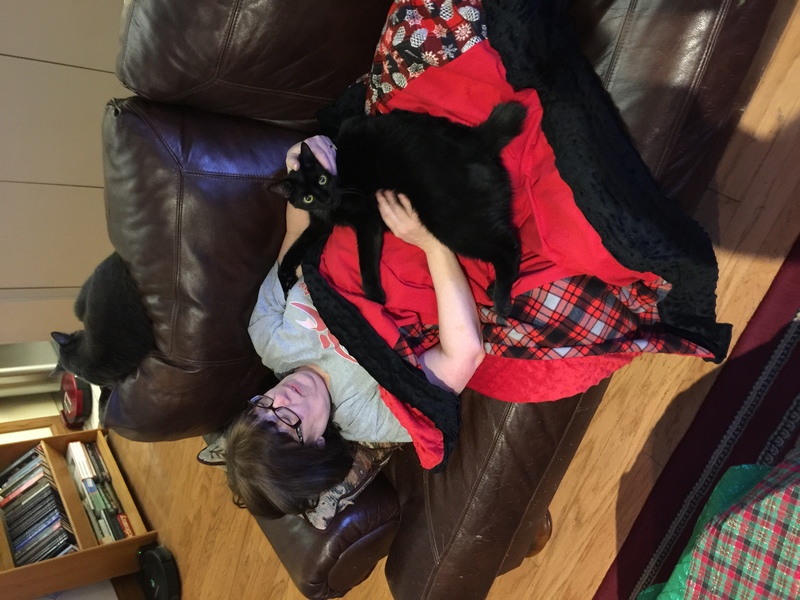 This year, Ponyboy has beefed up to about 16 lbs and when the three cats go racing around the living, dining room, and kitchen, he can be a formidable projectile. So we don’t think we’re ready to go back to a real tree, and got the plywood cat-loving tree we made previously, down from the attic. The coffee table needed some bright color…lucky for me, I had a cache of remnants that would fit the bill. 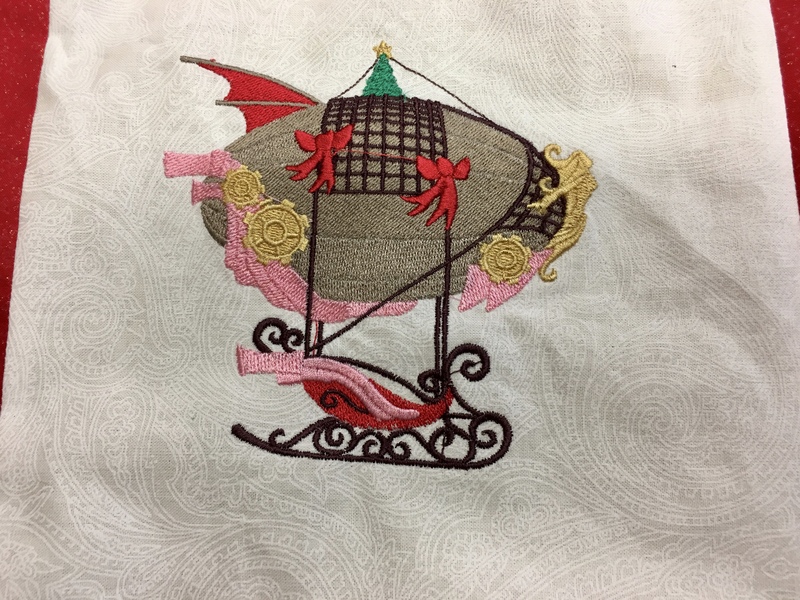 I started out with a whiteish piece of fabric, which I thought might work for a center square to machine embroider something on. I ended up giving this Urban Threads design a go: it’s a dirigible-driven sleigh for a steam-punk Santa. Then I squared up the fabric to the design, trimming the block to about 9 inches. 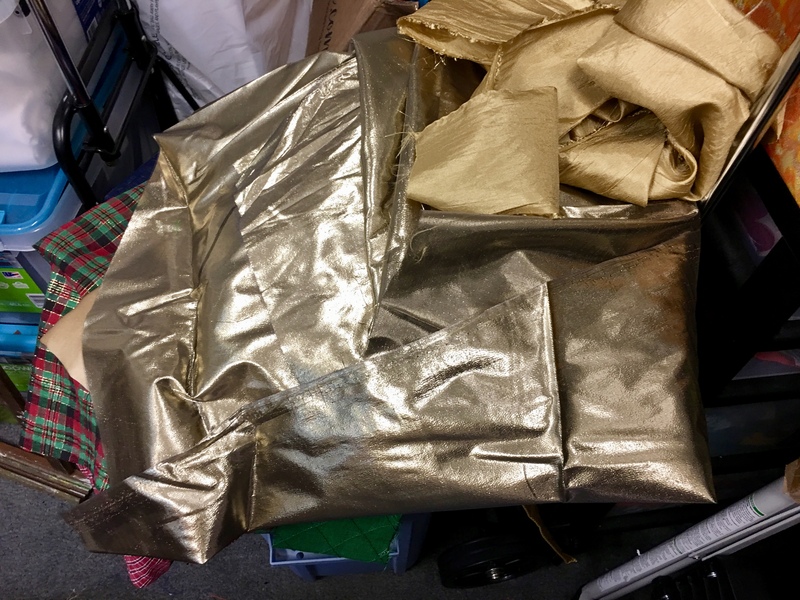 Of all the suitable remnants I had lying around in the hoard, I chose a bright red glitter cotton one, a polyester plaid shot through with gold metallic threads, and a polyester shiny metallic green fabric with diamond-patterned raised stitching. Jackpot, of course I picked the one that was wide enough. 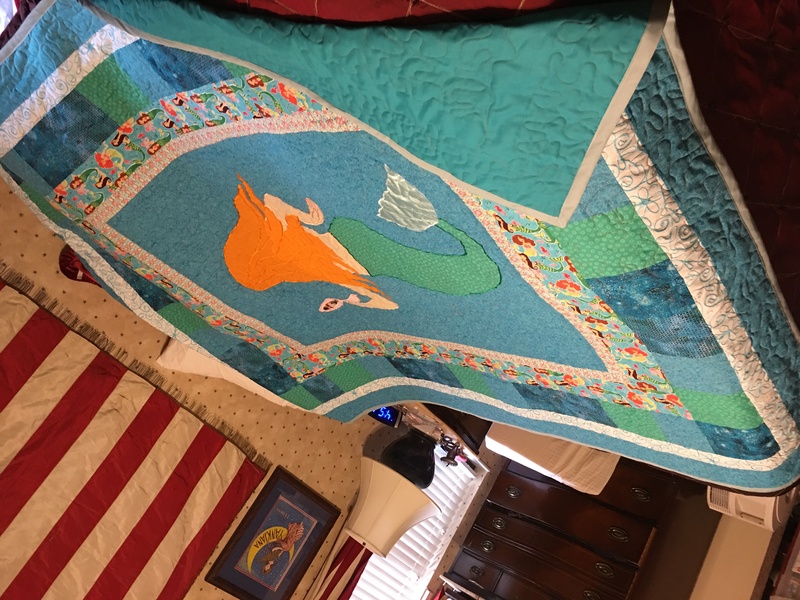 I pinned it, right sides together, to the pieced and stitched top, sewed around the perimeter, leaving a fist-size opening, then turned the inside out and pressed the edges. Then I stitched around the edge of the finished square. 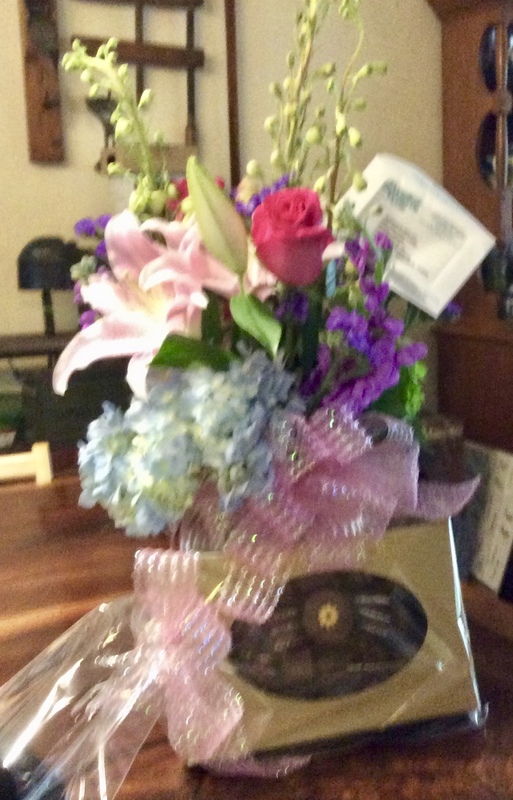 On the wall above the mantel in back, is what Skip calls…the Family “Palm” Tree. His hands, neck and arm were shredded (dog bite?) and one arm was limp from lack of stuffing. And one shoe was beginning to separate from its ankle. Job #1 was to repair the gaping wounds. I’ve had plenty of time to think about it. This project has been on the docket for a pretty long time, but it occasionally got covered up by a pile of fabric or a stack of mail, so it was out of sight, out of mind. Finally I picked up a hand sewing needle and found some thread that was close to this skin tone, and went to work. After I fixed up his body, a thought occurred to me. “Dude, what happened to your clothes?” He had no comment. I figured, why not make him something to cover up with? First set of pants bombed. The clodhopper feet were too big to squeeze through the skinny pant legs. The revised pair had velcro closures on the inseams. These pants are made from the actual several inches of pants legs that I cut off a pair of Skip’s pants [see prior blog post from 2015: Modern Hemming]. I confess, I’ve never been a whiz at making doll clothes. This quick-and-dirty “minimal effort” little project had me grinding my teeth as the tiny seam allowances sent fabric down the throat plate hole into birds’ nests that had to be cut from underneath to extricate them. I had a feeling that the previous clothes on this toy had something to do with the gaping slash on his neck; that the simple task of playing dress-up resulted in the doll’s near-decapitation. But although I don’t have a workable intuition about making clothes for this guy, I admire the workmanship that must have gone into making him. The meticulously fringed, pieced hair style, his embroidered facial features and chin-scruff, and his slouchy posture all give true representation of the “real” character [You know he’s not real, right? He’s a cartoon]. And then again, he was mass-produced. Somebody somewhere came up with a plan for toys like this to be created and then mass-produced. 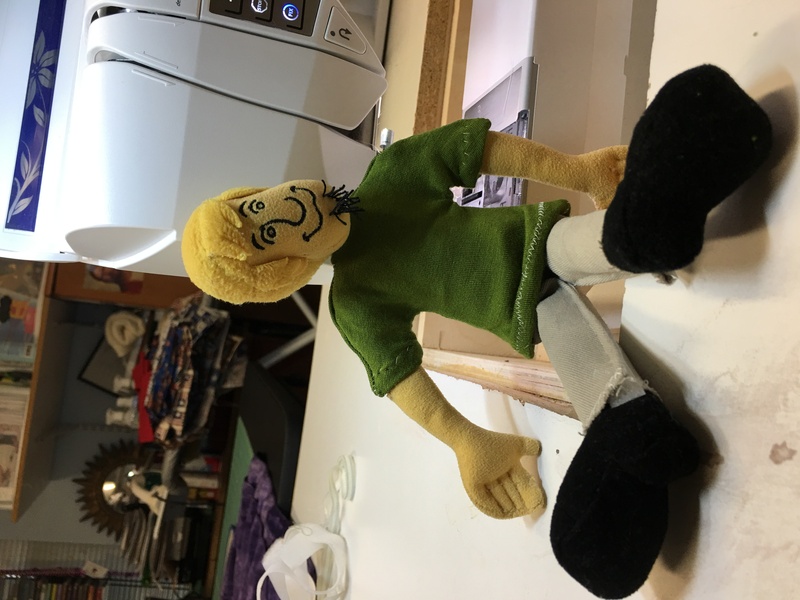 I imagine somewhere, a factory is probably humming with machines 24 hours a day, sewing goofy smiles and eyebrows lifted in surprise on cloth faces, adding darts on ankles and outlining fingers in little plush hands. The line supervisor gets an order from the shipping department saying: “Ten thousand more Shaggies” and proceeds to upload the manufacturing process specs. I did find this enlightening video on You Tube about toy designer Longia Miller, who I now hold in highest esteem! From watching the video, I see that her sewing machine is making use of a throat plate that has a tiny hole, down which it would be fairly impossible for a fabric to slip. You gotta love the visionary minds of the toy designers and makers, demanding realism, durability, safety, and worthiness of entertainment value to be built into our children’s playthings. Been busy and my little projects are humble! But I’ve had other things to do. 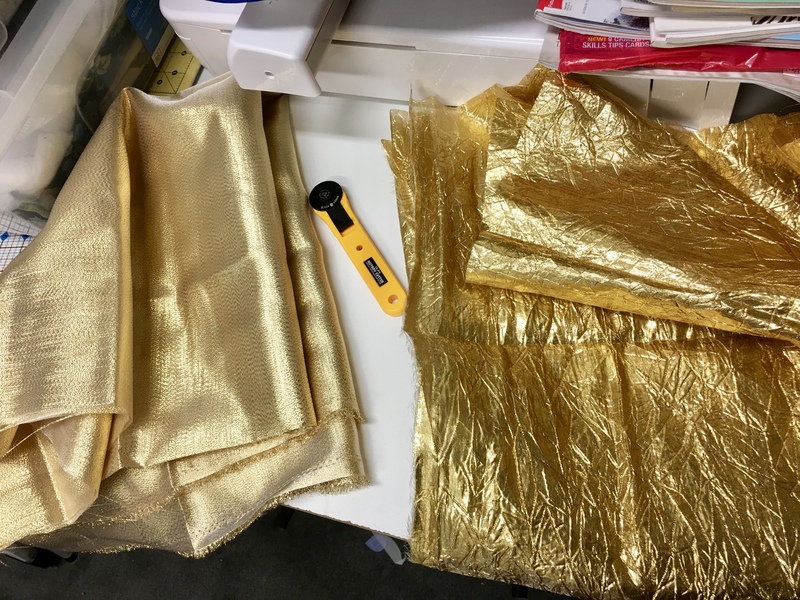 While shopping at JoAnn’s, I spotted a bolt of that extra-wide (108″) fabric that can be used as backings for large quilts, without having a seam. 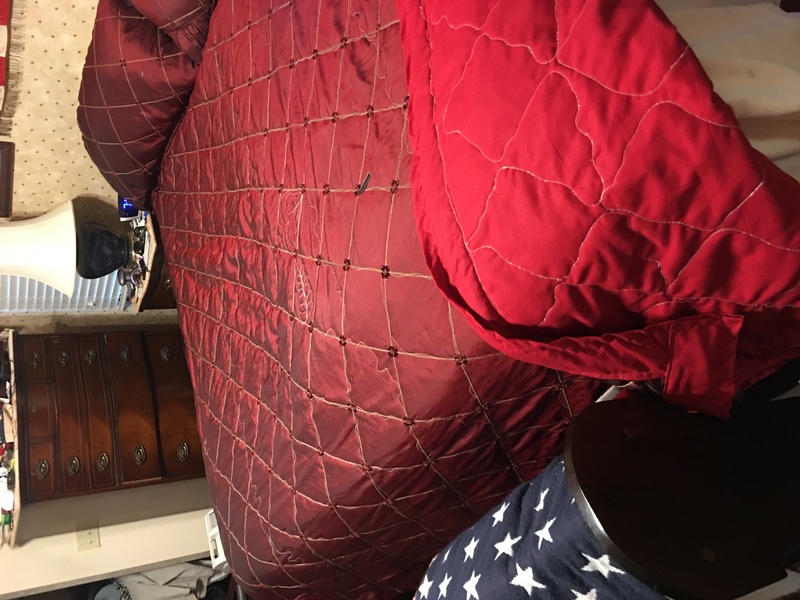 So I slashed the quasimodo comforter, removed the hump of bunched up batting and the nasty backing, and replaced both with something new. 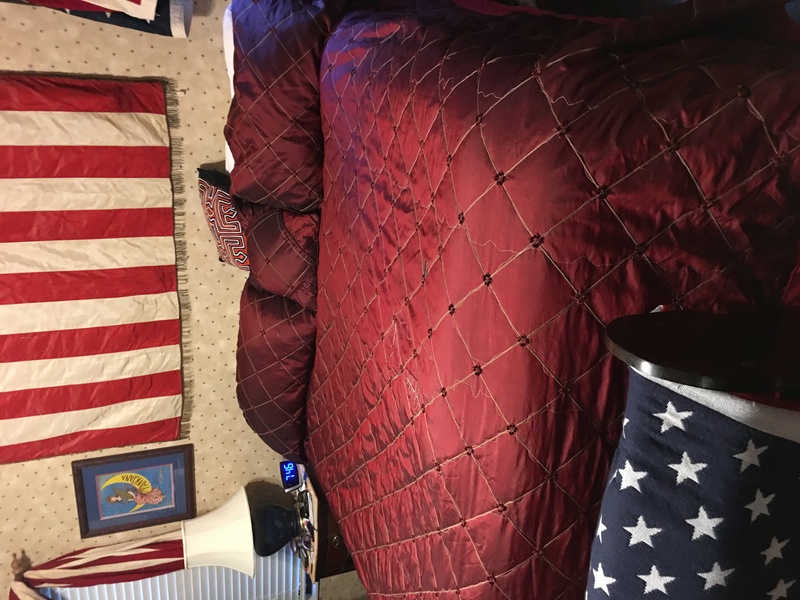 I thought of my grandmother, who told me that when she was young (in the Great Depression) they would cut the worn bedsheets down the middle and then re-sew them with the outer sides now seamed together in the middle. Waste not, want not! For quilting, I loaded it up on the king-size Grace frame, and I mostly traced over the embroidery on the satin top, and experimented a little with the Qnique. I didn’t care about making it perfect. 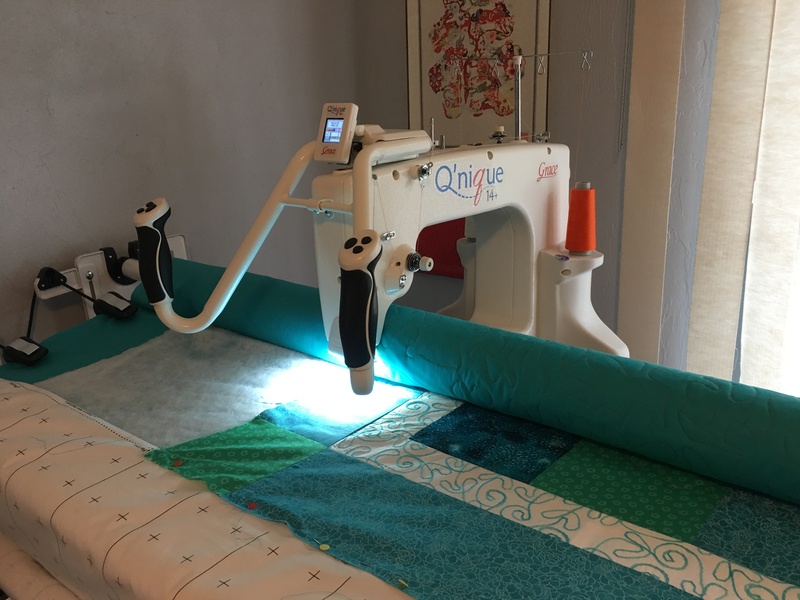 I still haven’t mastered getting the bobbin tension right with the Qnique. If you look closely at the quilted back of this table runner, you can see the ugly bobbin stitches. 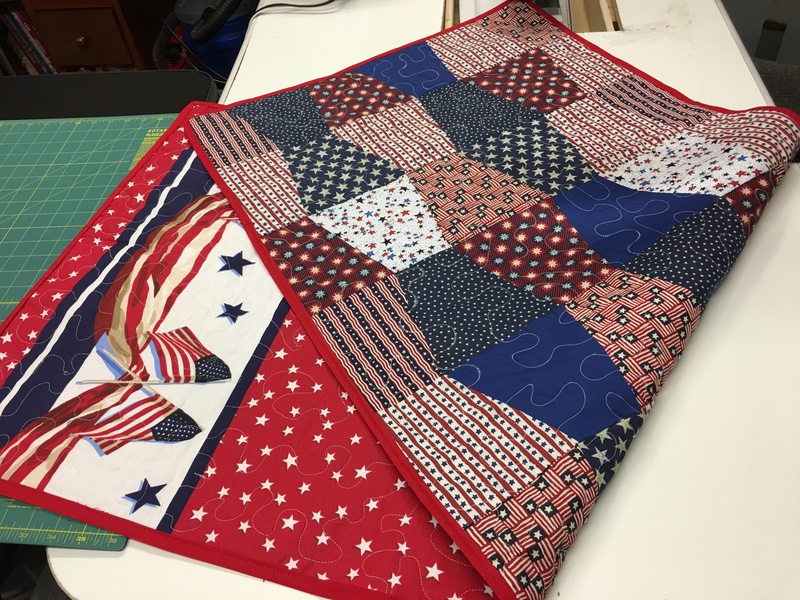 This Fourth of July table runner was made from a cute little remnant, a remnant piece of fusible fleece for batting, and a collection of red, white and blue remnants die cut into tumbler shapes with an Accuquilt template. Binding is Wright’s double fold bias tape. Are you watching fireworks tonight? Be safe. 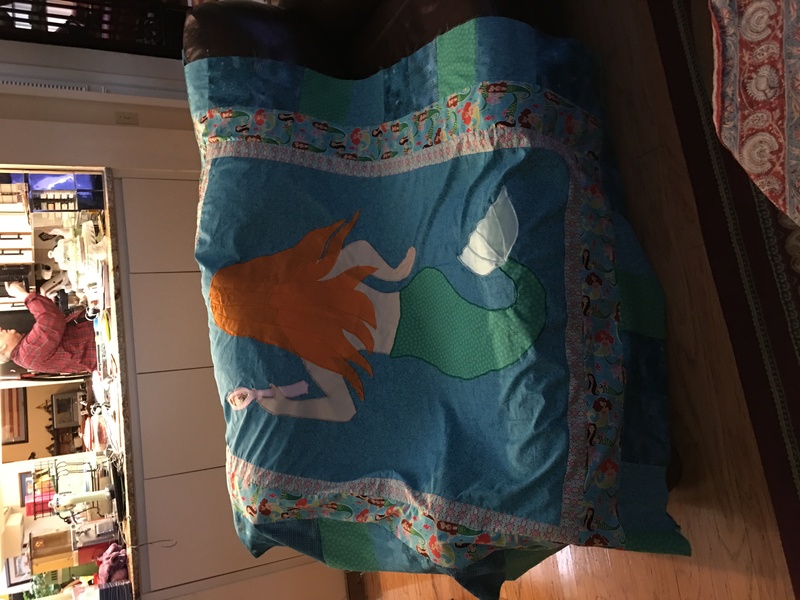 Google “Mermaid Blanket” and, would you believe, you’ll get way over nine million results! 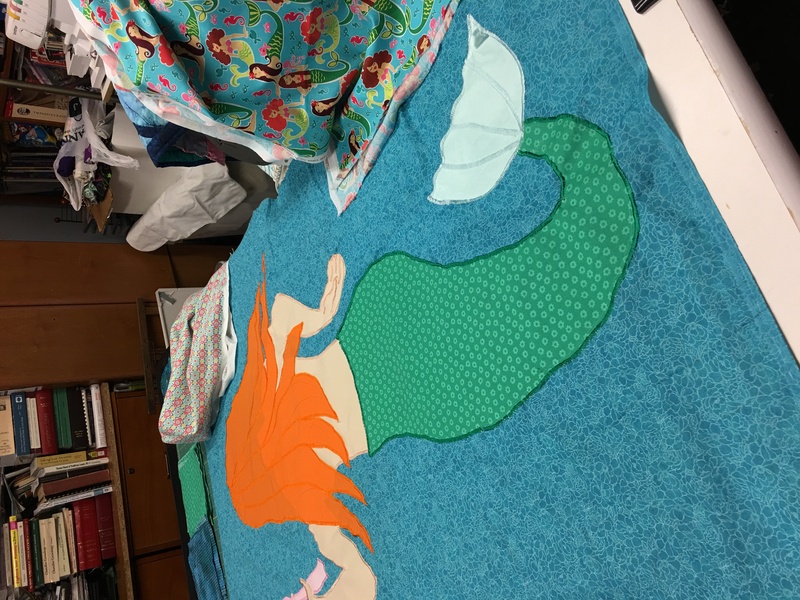 Mermaid blankets were one of the “it” gifts for Christmas this past year, for a girl toddler, teen or tween relative. Some were knitted, crocheted, and sewn from fabric. I didn’t jump onto the trend wagon, but I saw on Social Media that many big and little girls were posing with their fishtail blankies for the camera. I found a couple of remnants that might go together as a cute mermaid blanket. What do you think? This size blanket is for a tiny four-year old. 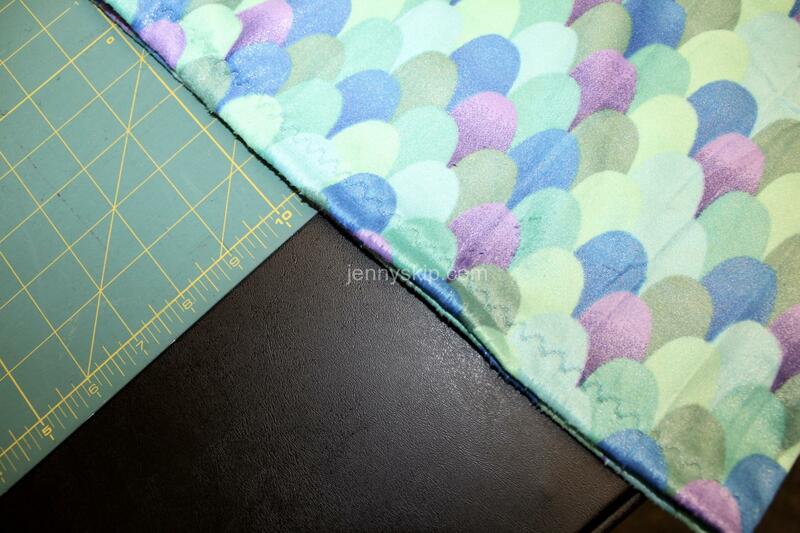 The blanket sheath is a polyester teal metallic mermaid fleece, 57 inches wide, remnant of .972 yard. The tail fin is from a remnant that I’ve had in the stash for eons, no idea where it came from. 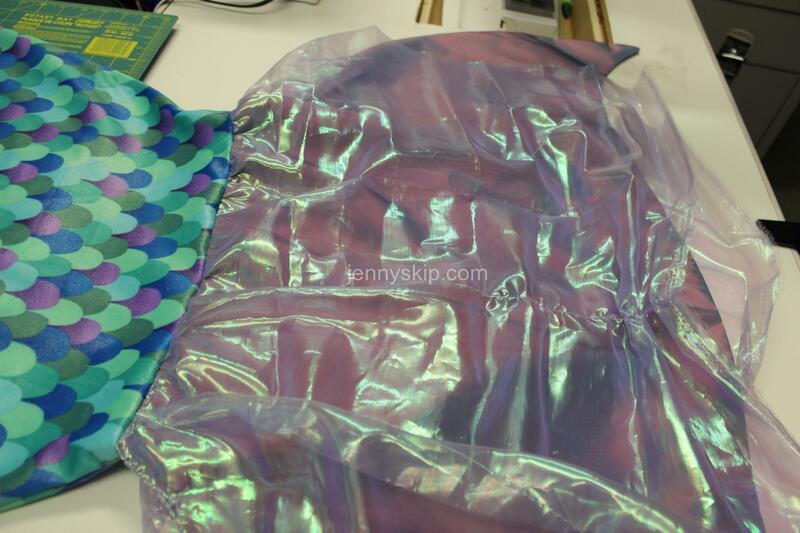 It’s a stiff, satiny, iridescent fabric that looks pink from one direction and purple from another. 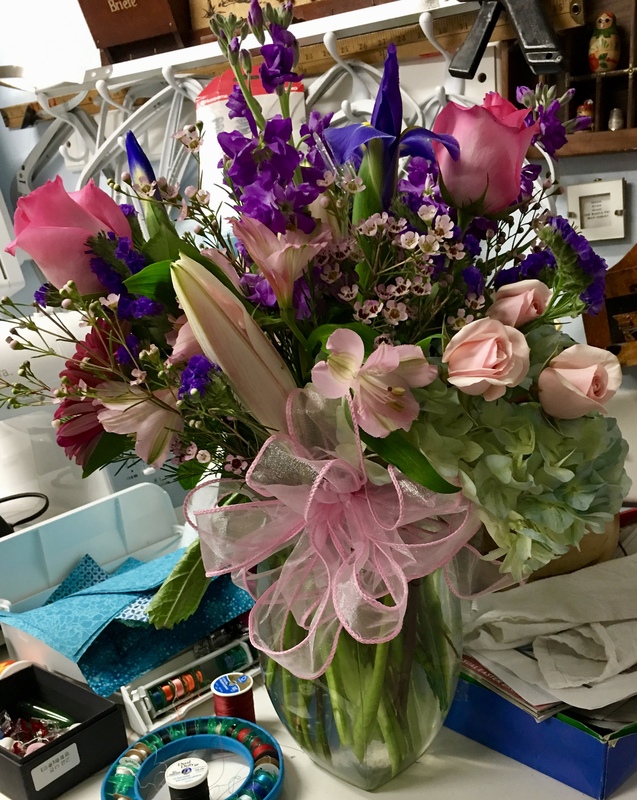 The saran-wrap looking flap on both sides of the tail is a Bumi Pearlized sheer lilac remnant just less than a yard in length. No pattern was used in the creation of this project. 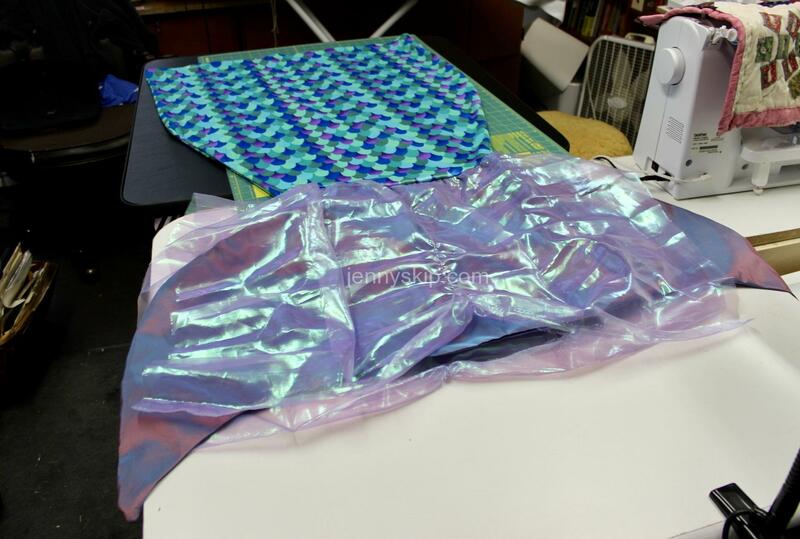 I just folded the pink/purple fabric, double, in half and sketched a tail fin shape on one side so that the fold was down the center of the fish tail, then cut it out. Thus, the tail was symmetrical on both sides. Then I unfolded it and seamed it together on all sides except for the opening at the top. Then I turned it inside out and pressed it, so that the edges carried that fishy curve. It would have been perfect if the pearlized fabric was the same size, so I could have just duplicated it and made a casing for the purple satin. But the pearlized remnant was smaller than the finished tail. So I played with the idea of attaching the pearly fabric as a ruched flap on either side of the tail, so it would flutter and swish like a real fish’s tail swerving around in water. Maybe a hair-brained notion, but there it is. After ruching the sheet of pearl in several places (centers, sides, and diagonally at corners), I cut a slit in the top fold, and since the slit ended up being a few inches longer than the tail side of the blanket, I sewed a basting stitch around the edges of the slit and drew it together, pulling on the basting thread, until it matched the size of the satin tail. 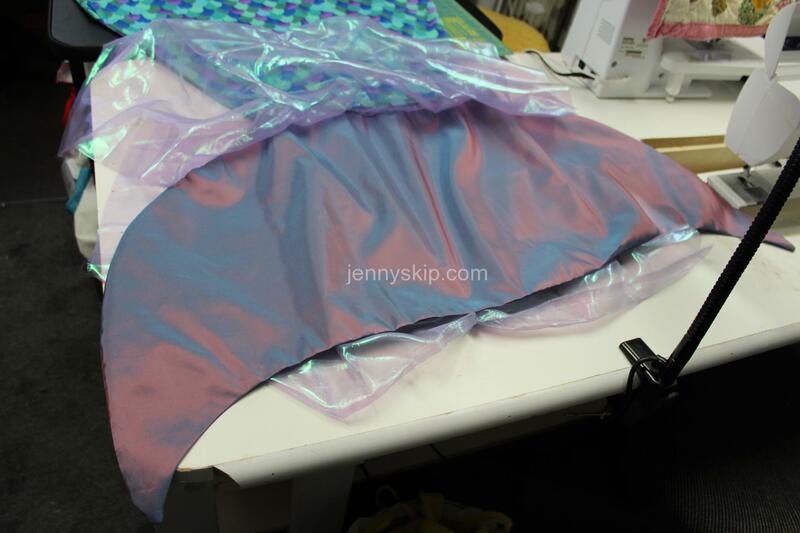 Then I sewed the pearl fabric on to the satin tail at the top. Turning the blanket fabric inside out, and matching it up to the opening of the tail, with right sides of blanket and tail together (a fabric sandwich of blanket, wrong side up, on top; pearl right side up, in the center; and satin, right side up, on the bottom) sewed tail to blanket in a 5/8″ seam, making sure the pearl material was lying flat at the seam line inside. It’s still a little chilly at night. This can be a toddler blanket or a grown-up foot warmer. Or maybe the kids can use it as a costume for Let’s Pretend, maybe a little kid version of Cosplay. 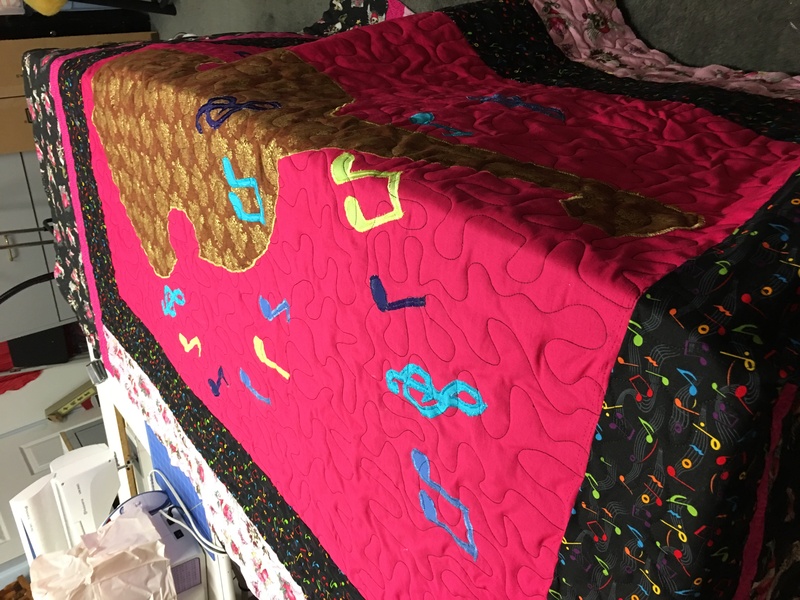 While technically not a quilt, it is a blanket that is pieced together so it’s pretty close…happy #NationalQuiltingDay and hope to see how others celebrated the day as well!